Donald Trump is determined to find self hating African Americans to serve in his cabinet. 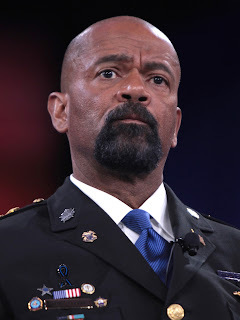 The President-Elect met with the most miserable man in law enforcement, Milwaukee County Sheriff David Clarke to discuss the possibility of Clarke running the Department of Homeland Security. Clarke is not totally unqualified as he obviously has a law enforcement background, currently commands 250 officers, and is sheriff of an entire county. By comparison The Department of Homeland Security has 240,000 employees, who span immigration enforcement, the U.S. Secret Service, the TSA and other functions. In Trump world adding over 239,750 more employees and responsibility for the entire USA shouldn't be much of a big jump. Clarke would fit in with Trump's law and order mantra and he definitely would be no friend to the Black Lives Matter movement or to black people in general. So why wouldn't Trump consider him for the DHS top spot?